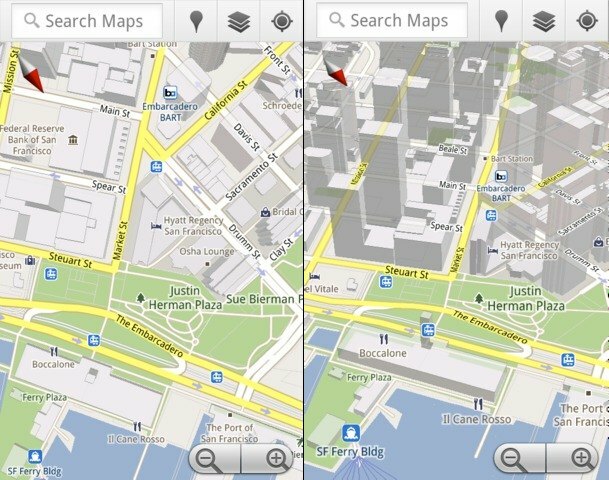 Google Maps 5 for Android comes with two features that make Google’s mapping software a lot more useful. Google now uses vector graphics instead of map tiles and it caches some of your most frequently used maps so that they are available offline. The new 3D view makes maps more intuitive and easier to use, but that’s not all. Since Google no longer has to download map images from its servers and vector-based maps require 100 times less data for all zoom levels, it’s feasible to cache data. “Rather than having a static set of maps when installed, Maps will automatically start caching the areas you visit the most when your device is plugged in and connected to WiFi (e.g., the nightly charge).” You can’t manually control caching, but it’s an important first step toward an offline Google Maps. Google Maps 5 for Android uses about 70% less data than the previous version, so it loads maps much faster. The new features require Android 2.0+, but not all devices support them. The list of devices that support all multi-touch gestures includes: Samsung Nexus S, Samsung Galaxy S, HTC G2, HTC Incredible, HTC Evo 4G and Motorola Droid/Droid 2/Droid X, while HTC Nexus One, HTC Desire, Sony Ericsson X10 and LG Ally don’t support rotating gestures.